PLEASE HELP ME HELP MY FAMILY!!!! What makes us different from anyone else requesting funds?? That I cannot answer but I have to try everything to save my family, so I pray that maybe while you decide on where you would like to donate or who to assist that you look at - Blake Squires, my very precious nephew and my very desperate family. The smallest amount I promise will help. 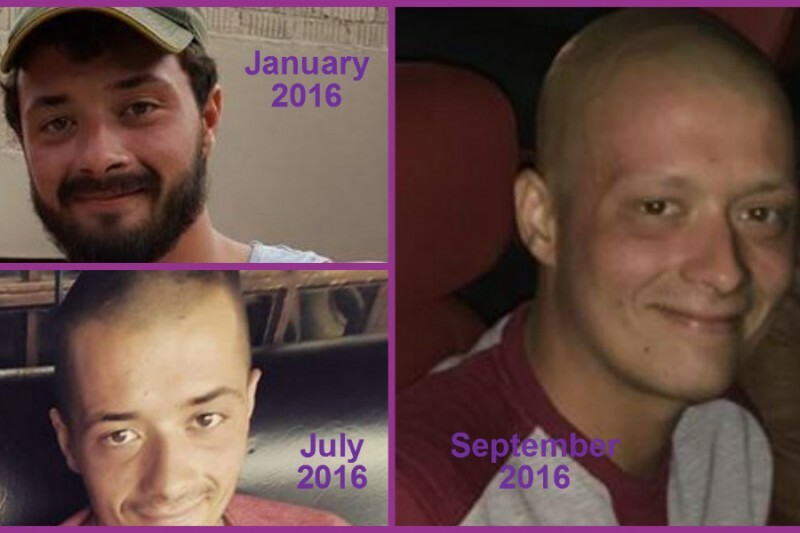 Blake was diagnosed with testicular cancer on the 1st June 2016, at the very tender age of 23 years. I had never heard of this type of cancer, only to learn it is prevalent in young men aged from 14 - 35 years. The news was shocking. We are all devastated, as you never expect it to happen to your children or your family it was alway other people. Now we are the other people!!! Blake's doctor sent him in to Port Elizabeth for tests after he was complaining of backache and severe stomach ache the week before. After numerous blood test and scans they found a small lesion in one testicle and many more lesions in his intestines. Blake was scheduled for 18 weeks of intensive chemotherapy. The good news then, was that the doctors said he should make a full recovery. Sadly half way through the treatment (Yesterday 15/08/2016) and a few more tests, Blake was diagnosed with Stage 4 cancer which has spread to his lungs. We as a family have hit a critical patch and urgently need to raise funds for Blake's continued treatment, and general costs surrounding his treatment. Blake is on medical aid but they will not cover all the expenses and extra hidden expenses. Blakes girlfriend or his mom or dad travel daily almost two hours to the nearest oncology hospital, so he can have his chemotherapy which lasts for 6 hours, then they drive back. This happens every day for five days - then off a week. The fuel costs alone are killing them let alone basic medications etc. My brother and sister-in-law have fought and tried so hard and have come to their end, they have sold off everything, lost their very productive business and stand to loose their farm and have nowhere to turn. I humbly beg from the bottom of my heart that any form of assitance will help. Just SHARING this site will help. I am based in Cape Town, South Africa and they are almost 1000km's away, I am organizing fundraising for them from all avenues. Please share this and please know that every cent will help at this critical stage. I make a promise to each and everyone that I will pay it forward....... when Blake recovers. xxxxxx I humbly thank you. To begin from where this started and then I humbly ask you to share this with at least one person. August 2016, I appealed for funds through Back a Buddy, Go Fund Me crowdfunding sites and started a Facebook group, for my nephew Blake Squires and his parents who were in need of urgent funds to cover medical shortfalls and currently further treatment, after their son - my nephew, was diagnosed with testicular cancer. The cancer had metastasized into stage 4 lung cancer, as well as numerous lymphoma abdominal tumors. This all came about as Blake had been complaining of back and stomach ache. Initially it was thought it may have been injured back muscles and then gastroenteritis but after been advised to travel to the Port Elizabeth hospital for further investigation, doctors, specialists and ultra sound revealed a 3mm irregularity on one testicle. The medical aid refused to cover any treatment unless the testicle was removed. Sperm was frozen - 16 vials - and surgery was scheduled for the next day. Results came back the testicle was completely calcified and had been removed. Blake was told he had testicular cancer, lymphoma tumors in the abdomen and stage 4 lung cancer. All Blake could tearfully conjure up was " Am I going to die?" Blake was scheduled for 18 weeks of intensive chemotherapy - five days a week for 6 hours per day. It was at this point the magnitude of this devastating situation hit home with me. Blake's parents cash business had been lost and their was little hope of regaining it. I sat and pondered on how I would feel if it was my son - no way to get fuel to get my child to the hospital for the life saving treatment. It was all too much for my soul to cope with. I sat and pondered and decided on setting up a web page, this required a Facebook page - for some reason I did all required but made a Facebook group as that could go public. I sat with every ounce of my being as to whether I should push the enter button. Finally I hit the enter key and my site almost immediately went viral. I challenged and motivated the friends joining the site. I sat on the computer 24/7 in order not to miss a comment. Three days later was my 50th but no time to celebrate I drove the site. The requests to make donations, help and prayer flawed me. I gave birth to the Go Fund Me account and followed it up with a Back a Buddy account. Many local donations went into Blake's bank account and money transfers were received. The community rallied and set up so many fundraisers in aid of the family's plight. Success became the driving force of the fund and motivated my energy levels. In the meantime Blake continued with the chemo therapy two hours away from his home. Blake's girlfriend drove the trip daily and sat in the car park , as she was not allowed in the chemo room, patiently she waited for the sessions to end, then drove the two hour trip back to the farm. She nursed him through the night, bad moods and continual vomiting. Only to leave early again the next day and so on for the following treatments. Never once did she complain she just did it and it became her way of life. Mid August Blake had further tests, the true fact of the lung cancer emerged!! Blake had not heard that statement at the initial consultation as he was so overwhelmed with it all. The good news was the oncologist was shocked to see him - he did not hold a positive outlook for Blake. A week later Blake received the results revealing that the lung cancer had gone. Was it the immense power of prayer or the support from friends and family???? - I would like to believe both. However the abdominal tumors were still large and prevalent. Blake would continue with the grueling chemotherapy - it got worse as the weeks went on, the continual vomiting and constant nausea became his norm. He lost all his hair and a huge amount of weight. Eyes sank into their sockets with dark black rings he looked so weak - yet he kept his strength and humor. Eventually weak and scared, but thankful the 18 weeks was over - he rang the infamous Cancer Bell. Cheered and congratulated from around the globe he was told he would have to wait one month before he could have a PET scan. The scan could only be performed in Cape Town, so yet another tiresome trip of over 2500km for medical treatment. Yet this scan would reveal the truth of whether the cancer was still in the cells. Again the world of friends and family waited in silence and hope for the results. It was the longest weekend ever, finally Monday morning the call came - Blake had NO active cancer cells. Great news but the fear of would they become active remains. The continued blood tests remain to check in cancer markers in the blood. Thankfully these drop slightly but we continue to pray for the marker to be 3. The poison - chemotherapy has increased risks and complications which have made Blake's system weak and unconditioned to fight the simplest of illnesses. Blake had flu which was made worse by his extremely weak immune system. Blake then developed painful shingles and had to be medicated due to the severity. Each complication is dealt with when it appears - that is all that can be done. The plan is to continue the fundraising to assist him with the shortfalls of all the medical bills and ones to come. Blake is due to travel to Cape Town at the end of January 2017, for yet another PET scan. Blake is a son, brother, boyfriend cousin and my nephew and we are now in a fight for Blake's health and continued life - Cancer free. Although he is on medical aid the shortfalls are catastrophic, adding to this his parents loss of their business and are unable to cover the costs for Blake. Therefore I continue to appeal to one & all to help Blake on his Journey back to full health and recovery by donating funds to assist in clearing these medical bills and for his future treatments through our two crowdfunding sites. Anything WILL make a difference - No matter how big or small!! Thank you and Many blessings. Thank you to all our supporters every cent is greatly appreciated as the medical bills keep rolling in. Please note that donations from all over the world may be made into our South African, sister crowdfunding site Back a Buddy . It has a conversion table for your convenience and funds are deposited directly into the fund bank account. We trust this will assist many of you. Thank you for your continued support. Update on Blake, with being his last week of chemo this round. He had a blood test for his marker and an appointment with his oncologist Dr. Maart, his marker is now down to 7, from 230,000 so that positive? His onchologist feels Blake should not need any more chemotherapy. However in 4 weeks Blake will have to travel to Cape Town for a CAT scan, as the machine in Cape Town observes cell activity, and the one in Port Elizabeth only observes cell structure. Once the results for this are known the decision to the next steps will be taken - i.e laser radiation, surgery or more chemo. This week is the final of this chemo session and he travels daily to Port Elizabeth for the next five days, and six hours of chemo per day!!!! We continue to pray for Blake and really feel for him, he is so very strong and brave. for such a young person!!! After seeing his specialist today, the news is still good, thank God that he has no active cancer. He was not given the all clear though as he still has enlarged lymph nodes in his abdomen, which means more scans in three months time as they have to keep an eye on them. so not quite out of the woods yet! Please keep donating as he still has lots rocky road to travel, and the expense is never ending, his last scan was R21,000. and although paid for by medical it does not cover R4,000 in fuel, overnight accommodation, food etc, and still not working. Prayers also very welcome. Blake is in remission, his specialist phoned on Thursday to say he has no active cancer, he has an appointment tomorrow with his specialist, for a blood test and a detailed report on the scan, I will give you an update on that. Thank you for your continued support and prayers! God bless. Hi everyone, thank you so much for your continued donations, it all helps so much! Blake has his scan in Cape Town this Friday the 29th October, will let you know the result, fingers and toes crossed and prayers welcome. Blake has now had 6 sessions of chemo, which comprises of 5 days of trips into Port Elizabeth, 150km away, then 6 hours of chemo, two weeks off then 5 days again. His white cell count was low, so he has to have 3 injections into his stomach @ R4,500 a jab. The last session was hopefully his last, over the last week he has suffered horrendous mouth ulcers, earache. swollen gums, weakness in his muscles and depression, but everyday feeling a bit better. His next trip is to Cape Town 1000km away, on the 28th of this month, as he has to have a specialized MIR scan, the one in Cape Town looks at cell activity as apposed to the one in P.E. that only sees sell structure as they want to see if the lesions in his lungs and abdomen have gone, if not it means radiation therapy or surgery. He is obviously quite worried about the outcome. The god news is that his cancer cell count has gone from 230,000 to 12, it should be around 0 -2, so with the next blood test fingers crossed. Your continued support, interest prayers and donations are gratefully received. Thank you from the bottom of our hearts. Thank you Ratty and Janice for your wonderful donation, God bless! Hi Everyone, Dicovery health are refusing to pay for additional chemotherapy, Blake needs two more rounds plus additional scans and maybe an operation or radiation, will have to speak to specialist on Monday and find out hat we can do, will keep you posted. Blake is coping OK, chemo weeks are terrible he gets so very sick straight away, and then just as he starts to rally bang another round of chemo. Thinking of you Blake, Amber and family. Blessing to Blake,Amber ,Dee & Reay and Karen.I hope this helps and I make this donation in Christs name that where there are burdens they would be alleviated and that all sickness be healed in Jesus name.God bless and lots of love, standing with you all in prayer, Catherine.